Dr. Lauren Lewis - Pediatric Dentist With A Heart As Big As Her Smile! Dr. Lauren Lewis graduated in 2007 from the University of Maryland’s Baltimore College of Dental Surgery. She then gained some invaluable experience helping children and adults with special needs while on staff at Kernan Hospital Dental Clinic in Baltimore. In 2008, she began her residency in Pediatric Dentistry at the University of Pittsburgh’s School of Dental Medicine and received her Certificate in Pediatric Dentistry in 2010. A year later her board certification from the American Board of Pediatric Dentistry followed and fast forward to today, Dr. Lewis is also now a member of the American Academy of Pediatric Dentistry, the Maryland Academy of Pediatric Dentistry and also the Special Care Dentistry Association. 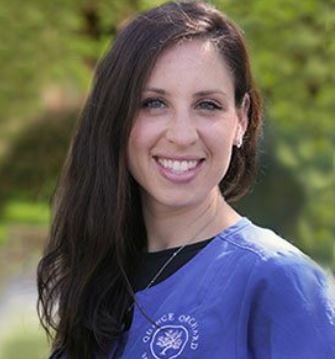 In 2011, Dr. Lauren Lewis and her husband, Dr. Mehran Rouhanian, started the Quince Orchard Dental Care practice with a mission to make a difference. Who really is Dr. Lauren Lewis? What drives her to provide exceptional care for her little patients, foster a family environment and manage the complexities of catering to her little patients, especially those with special needs? When asked about this, Dr. Lewis spoke empathically about being of service to others as her main driving force. Her inspiration first stemmed from her childhood observations of her mom, Diane Lewis, who worked with special needs patients at a pediatric dental office. "After that, I realized how much of an impact I could have on a family who has children with special needs by just being kind and patient and providing the care for them that everyone deserves." It was then she had decided she only wanted to be a Pediatric Dentist and there was no doubt in her mind about that! Dr. Lewis is always looking to improve on how pediatric dentistry is practiced. She implemented the 'open bay format' as part of her philosophy which is aimed at specifically improving the experience of patients by having multiple patients in the same room at the same time. She has found that her young patients tend to feel less anxious when they can see others just like them being treated. One of the most heartwarming experiences for her was when a patient who does not have special needs was sitting in a chair in the open bay next to a patient who has Autism. When the young girl saw that the boy with Autism was having a difficult time cooperating for his appointment because of his anxiety, she got up and went over to the boy, held his hand and calmed him down. This was a wonderful experience for Dr. Lewis, as well as for the parents of both of these patients. Along with the heartwarming occurrences, Dr. Lewis really feels a sense of fulfillment and reward in getting to know all of her patients personalities and seeing them grow up. Her business approach is one that realizes that collaboration is essential to success. She strives to position her practice at Quince Orchard Dental Care as a part of the puzzle and not as a competitor with dentists in the area. She recognizes that many dental services are offered under one roof here at Quince Orchard Dental Care, she ensures that ample consideration is given to those that refer patients to her and is always looking to reciprocate. On a personal note, Dr. Lewis enjoys spending time with her family. Her two daughters, Ava and Ariana, are quite involved in extracurricular activities including soccer, tennis, ice skating and ballet and so being a part of those activities and watching them grow is very important to her. When she's not off being a soccer mom, she gets bendy in her yoga practice and also enjoys a good game of tennis. In fact, it's a dream of hers to one day go to all four grand slam tennis tournaments. So far she has only been to the US Open and that was quite an experience! Everyone has someone in their life whom they believe have helped shaped them into the person they are today. For Dr. Lewis, it's not just one person. Her success, not only in her practice but her life, has come from the support of her family. Her mom, her husband, and the late Dr. Morgenstein, her mentor, who she added “Quince Orchard Dental Care was modeled after”, all played significant roles in her life. Dr. Lewis believes that loyalty is one of the core values every person should have. “Staying loyal and true to people, the practice and what you stand for” is what she aims to live by every day. Those are just some of the reasons why our employees and patients adore her, as she does them! Now that you're acquainted with Dr. Lauren Lewis, be sure to bring your little loved ones by to meet her and say hi the next time you're visiting us at Quince Orchard Dental Care.